Bosch’s GCL 2-50 C Professional and GCL 2-50 CG Professional combi lasers will be available soon for simple levelling applications at distances of up to 50m. They are also the first combi lasers worldwide which can be controlled via app and Bluetooth interface. 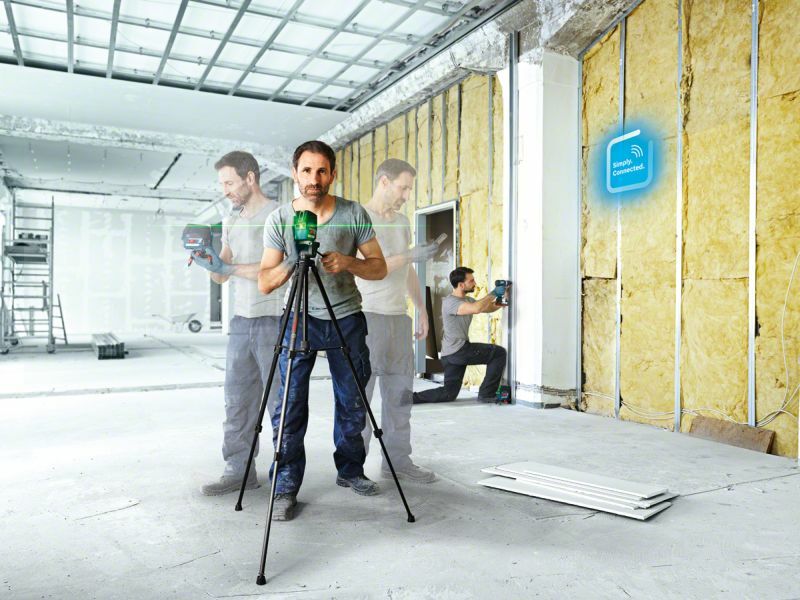 Each combi laser projects vertical and horizontal lines onto the wall as well as a centred plumb point on the floor and ceiling, which can be switched on and off individually using the new Bosch Levelling Remote App. Users can also adjust the brightness in order to make lines more visible or to preserve battery life. The charge status of the battery and selected mode can also be seen directly in the app. The Bosch Levelling Remote App is available for free in the Google Play Store and in the Apple App Store, and is also part of the Bosch Toolbox App. The RM 3 Professional multifunctional mount is motorised and can also be controlled via app. Alternatively, the RC 2 Professional infrared remote control is also available. Both options align the combi laser with millimetre accuracy at three different speeds. This is especially helpful when working at a distance from the device or on a ladder, as it allows precision adjustments remotely. The power supply is provided automatically by the combi laser energy source. Both devices are also available with the non-motorised RM 2 Professional mount, which is aligned manually. The multifunctional mounts can be screwed onto drywall or wooden beams, their integrated magnets allow them to be attached to magnetic structural elements, or they can be secured to existing profiles using a clamp. While the GCL 2-50 C Professional produces red laser lines, the GCL 2-50 CG Professional uses a true green laser diode to project lines, which are four times more visible – an advantage in bright environments. In addition, the green laser diode is more powerful in comparison with devices that use colour conversion from red diodes into green light. It also has a longer lifetime thanks to its lower operating temperature and is more compact. Both combi lasers are suitable for a variety of work tasks, like transferring plumb points for electrical installations or marking reference points. Proven functions such as tilting for diagonal alignment have been retained. The intuitive keypad makes operation easy and the device’s levelling accuracy of ±0,3mm/m guarantees precise results. Both devices level themselves in less than 4s and compensate for surface irregularities of up to ±4°. They are powered either by a replaceable 12V rechargeable battery from the professional range or with four AA alkaline batteries together with the AA1 Professional battery adapter. The rechargeable battery is compatible with all 10,8 and 12V professional tools from Bosch. The GCL 2-50 CG Professional uses a true green laser diode to project lines, which are four times more visible than devices that use colour conversion from red diodes into green light. It also has a longer lifetime thanks to its lower operating temperature.